We were able to generate a single accurate and reproducible remote sensing model of tidal marsh aboveground biomass and carbon that represents nationally diverse tidal marshes within the conterminous United States (CONUS). The final model, driven by six Landsat vegetation indices and with the soil adjusted vegetation index as the most important (n=409, RMSE=310 g/m2, 10.3% normalized RMSE), successfully predicted biomass for a range of marsh plant functional types defined by height, leaf angle and growth form. With a mean plant carbon content of 44.1% (n=1384, 95% C.I.=43.99% – 44.37%), we generated regional 30m aboveground carbon density maps for estuarine and palustrine emergent tidal marshes as indicated by a modified NOAA Coastal Change Analysis Program (C-CAP) map. 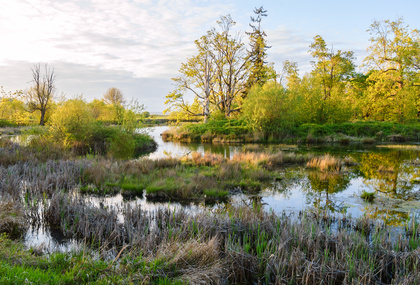 This modeling and data synthesis effort will allow for aboveground C stocks in tidal marshes to be included for the first time in the 2018 U.S. EPA National Greenhouse Gas Inventory for coastal wetlands. With the increased availability of free post-processed satellite data, we provide a tractable means of modeling tidal marsh aboveground biomass and carbon at the global extent as well. 1) Given that NOAA’s C-CAP land cover maps are derived from Landsat, we could fuse carbon density values with land cover values at the same resolution and extents. Change in both of these features is needed for national greenhouse gas inventories. 2) Two of the six vegetation indices selected for the final model included SWIR bands – this information is useful for mapping biomass, and identifying water. Why do you think the soil adjusted vegetation index the most important of the six vegetation indices used as biomass predictors in your model? I don’t have a definite answer, but we used data from six different estuaries from around the country. Its possible that substrate reflectance values differed from one region to another, and SAVI helped to control for this background signal in the vegetation reflectance. 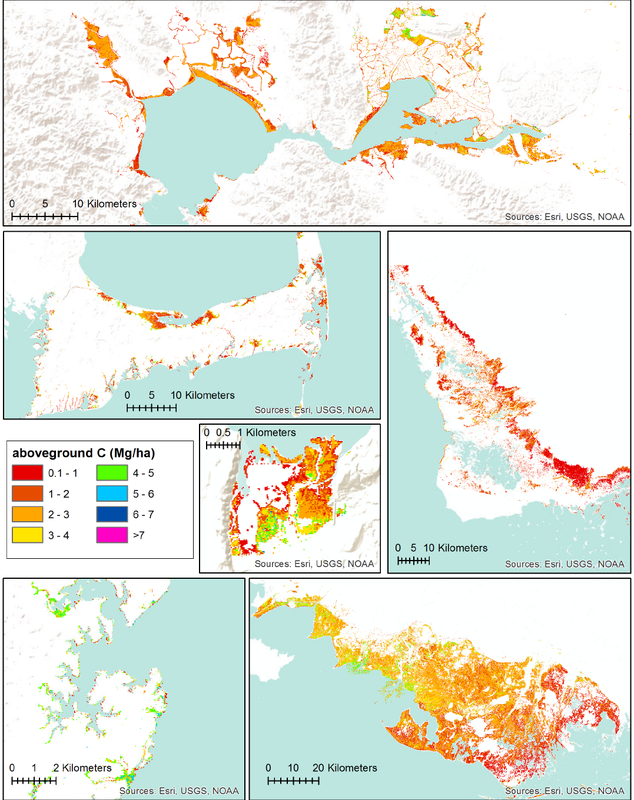 Tidal marsh aboveground carbon density maps of six study regions, based on the final biomass model and plant percent carbon content data. Moving from top, left to right: San Francisco Bay, CA; Cape Cod, MA; Everglades, FL; Nisqually National Wildlife Refuge, WA; Chesapeake Bay, MD; Terrebonne and St. Mary Parishes, LA. Image credit: Byrd et al.